Family Sleuther: Will The Real Kirk Daughter Please Stand Up? Will The Real Kirk Daughter Please Stand Up? Do you ever tiptoe around conflicting information in your genealogy? You know full well that you'll eventually have to reconcile the discrepancies, but you're afraid of what you'll uncover in the process. What if the oft-repeated family history is undermined by inaccuracies and the whole tree has to be taken up roots and all? My every spare moment is currently dedicated to a book that I'm writing about my fifth great-grandfather Thomas Kirk. The integrity of the writing process is shaped by the quality of the research. There's no better way to surface inconsistencies than trying to stitch conflicting facts into a single narrative. Telling Thomas' story requires me to tell the stories of his children - all 13 of them. I've done my own exhaustive research on my direct line of descent, but only a precursory review of Thomas' other children. Up to now, I've relied to a considerable extent on a handful of genealogies - published by descendants of Thomas' other children - that are decades-old and repeat the same pedigrees. Their unanimous consensus on the Kirk family tree created a perception of undisputed fact. I accepted it as such. 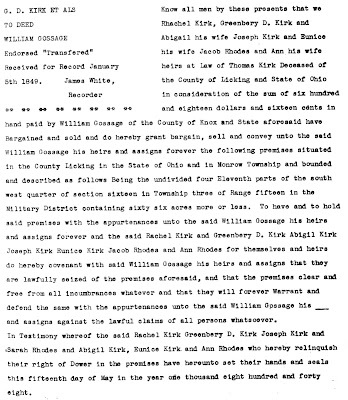 The inconsistencies centered around one of Thomas' daughters Nancy Kirk who, according to the proliferating genealogies, married Joseph Roads. During my research, I pulled their obituaries. The questions soon started. 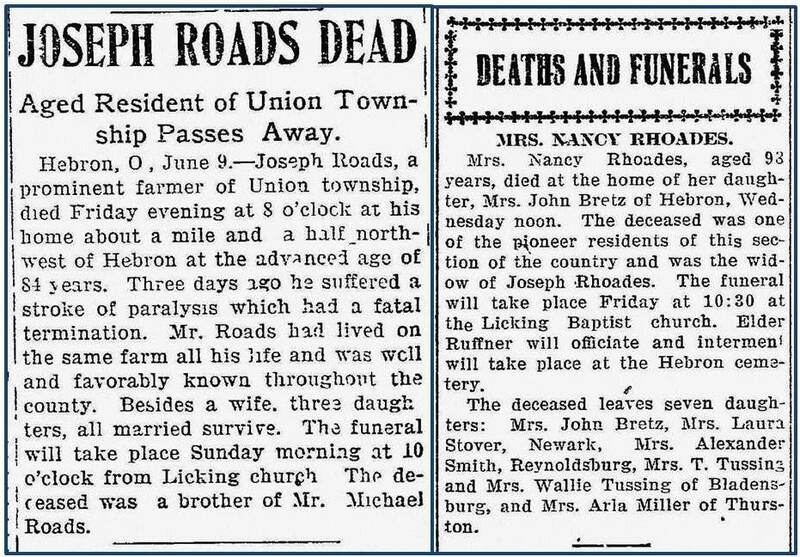 The spelling of the surname Roads appeared differently throughout the records, so I wasn't overly concerned that Joseph was Roads while Nancy was Rhoades. 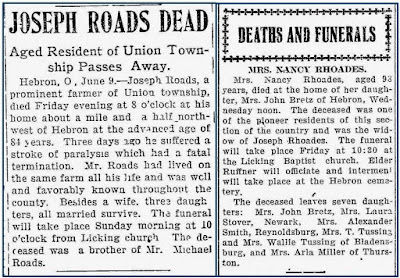 However, why did Joseph's June 1900 obituary state that he was survived by a wife and three daughters while Nancy's 1907 obituary said she was survived by seven daughters. Clearly, the numbers didn't add up. I assumed, though, that there was an explanation and I would just have to scrutinize the family's dynamics more closely. As I reviewed the evidence, other curious inconsistencies surfaced. For example, Nancy's obituary noted that her funeral would take place at the Baptist church. That was, I realize now, another red flag. Thomas Kirk and all of his children had close affiliation with the Methodist church. Any one of them subscribing to another denomination should have required a review and explanation. That didn't happen. Recently, a photo hint popped up on Ancestry for Nancy and Joseph Roads. The photo was added by one of their descendants and linked to an extensive tree. According to that tree, Nancy's maiden name was not Kirk. Instead, Nancy was listed as the daughter of Samuel Moore. Generally, if someone has the family photos to back up their research - which none of the Kirk genealogies had - the research requires a closer look. Nancy was already problematic for Thomas Kirk family history. She had given her father's birth location as Ohio in the 1880 census and New Jersey in the 1900 census. While her responses differed from each other, both answers contradicted those of Thomas Kirk's other children who unanimously said their father was born in Virginia. Nancy was always odd woman out. Now, it was increasingly clear that she was likely not a daughter of Thomas Kirk. Returning to the records, I was able to quickly pinpoint the mistake. Thomas Kirk died in December 1846. In March 1847, his son James was appointed administrator of his estate. 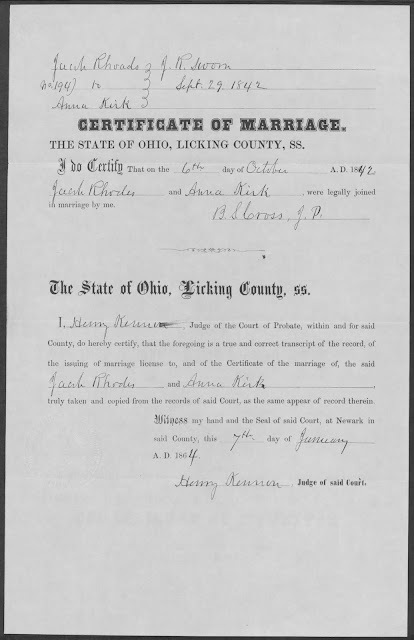 The probate process concluded sometime in early 1848 (the exact date and details are unknown because, tragically, the Licking County Courthouse and most of the probate records, including Thomas', were destroyed in a fire). Fortunately, land records that were created as a result of his estate's settlement survived. Thomas' heirs at law - his eleven surviving children - inherited his farm. Each child received a 16.5 acre share of the property, and, as a group, were party to a quitclaim deed that transferred each of those individual 16.5 acre shares to a single man - William Gossage. The individual endorsed transfers named each of Thomas' children. On May 15, 1848, four of Thomas' children were party to a single endorsed land transfer. Among them was "Jacob Rhodes and Ann his wife..."
This is the only known record to link Thomas Kirk with a daughter who had the married name Rhodes. Her first name was Ann not Nancy. Her husband was Jacob not Joseph. The surname was spelled Rhodes. 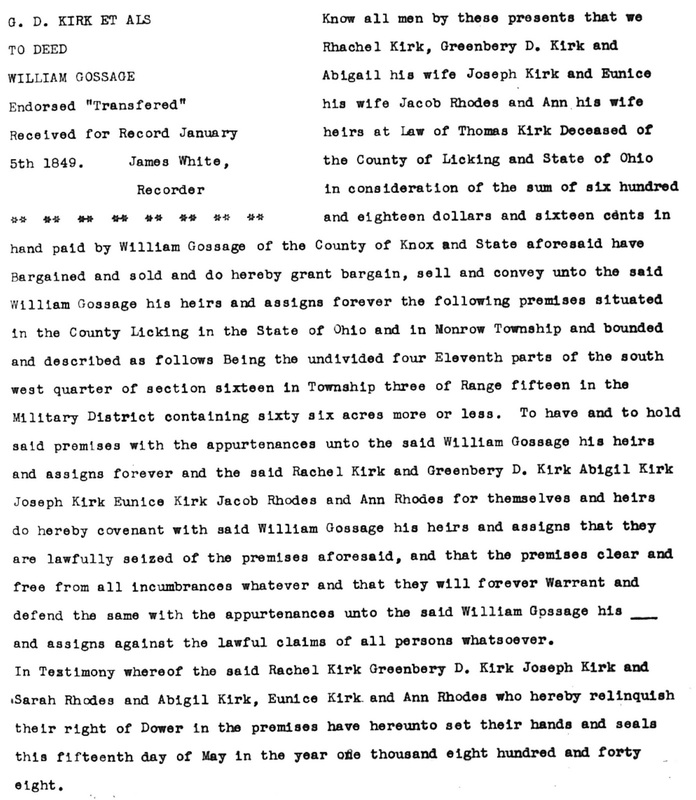 I quickly found Ann and Jacob Rhodes in Licking County in both the 1850 and 1860 censuses. They lived about 20 miles northwest of Nancy and Joseph Roads. Jacob enlisted during the Civil War and tragically died in July 1863. Ann applied for and received a widow's pension for her husband's service to the Union. I braved the recent arctic "bomb cyclone" - that channeled torrents of frigid gusty wind and snow into Washington - and trudged to the National Archives. After clearing security and thawing out, I discovered that I had the power all along to answer my research question from the cozy warmth of my own home. Jacob's Civil War pension file had been digitized and was online! Among the records in the file was a copy of Jacob's marriage certificate. The original was destroyed with other records during the devastating courthouse inferno. The duplicate copy revealed that on October 6, 1842, Jacob Rhodes married Anna Kirk. The pension file also listed Jacob and Anna's children, which included a son named Jessie Greenberry Rhodes. This peculiar name jumped out at me because Thomas Kirk had a son named Greenberry Dorsa Kirk, who was, incidentally, also party to the same above-mentioned quitclaim endorsed land transfer with Anna. Eventually, Anna (Kirk) Rhodes moved from Licking County, Ohio, where she was enumerated in the 1880 census, to Polk County, Iowa, where she was enumerated in that state's 1885 census. Iowa death records show that Anna died in 1888. Sadly, her link to the Kirk family was lost and even usurped by another woman. A thorough review of the genealogical records is finally correcting the history and restoring both Nancy and Anna to their respective families. The example of Anna (Kirk) Rhodes serves as an important reminder to scrutinize the small inconsistencies, especially when they continue to pile up. It may be your ancestors gently pointing out the mistakes they need you to resolve. It's important that we pay attention. Excellent sleuthing by following all those clues! Love your methodology. Thanks, Linda! 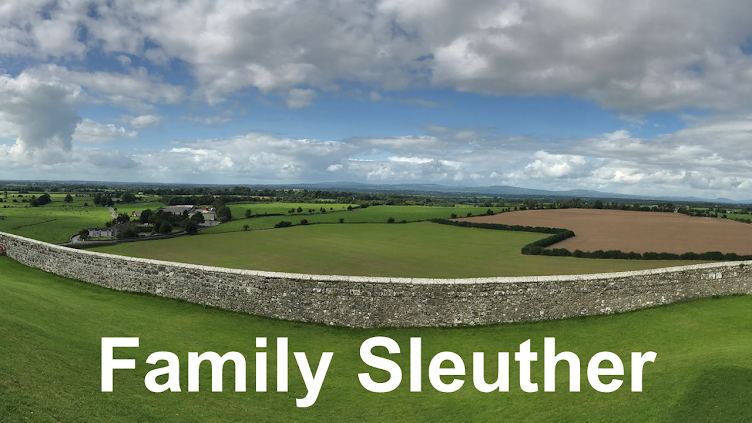 It's exciting - the genealogy high - when the clues lead to one another and support your theory like they did in Anna's case. Congratulations, Michael. You may have been dancing around conflicting information but in the end I can imagine your did a jitterbug!! Kudos on your sleuthing. Because I'm trying to keep my attention focused on writing my book and maintain my momentum, I was secretly hoping that I was imagining the inconsistencies and wouldn't have to pause to research to resolution. That didn't pan out, but once I got on the case it was gratifying to bring the truth to the surface. And jitterbug I did! Outstanding work, Michael! It is scary how repeated misinformation becomes perceived as fact (we see that more and more, don't we?). Now how do you prevent future researchers from relying on those incorrect trees? I face this often and even when I've alerted the tree owners of an error, it seems to get ignored, and more people continue to repeat the mistake. 1. I administer a Facebook group of Thomas' descendants who are generally more engaged in the family history. I've submitted a post making my case for the real daughter being Anna (Kirk) Rhodes, and asked folks to update accordingly or ask me questions. 2. Next, for Ancestry (the bigger beast), I think I can add a comment to public member trees and I may try to do this where I find Nancy Moore mistakenly linked as a daughter to Thomas with a hyperlink to this blog entry. It's a challenge for sure, but I'm hopeful this will make a bit of a dent in things. Yes, Ancestry is the beast. In the past I've sent gentle notes to tree owners suggesting that there might be an error and then explaining why I think some entry they have is not correct. Only rarely did anyone respond, and even more rare was a thank you and an acknowledgement of the error. Most people didn't respond and, of course, did not change their trees. But it's worth a try! Good luck!